In the previous post I demonstrated an implementation of the Customization Aware Web Resource approach using SOAP to retrieve metadata. 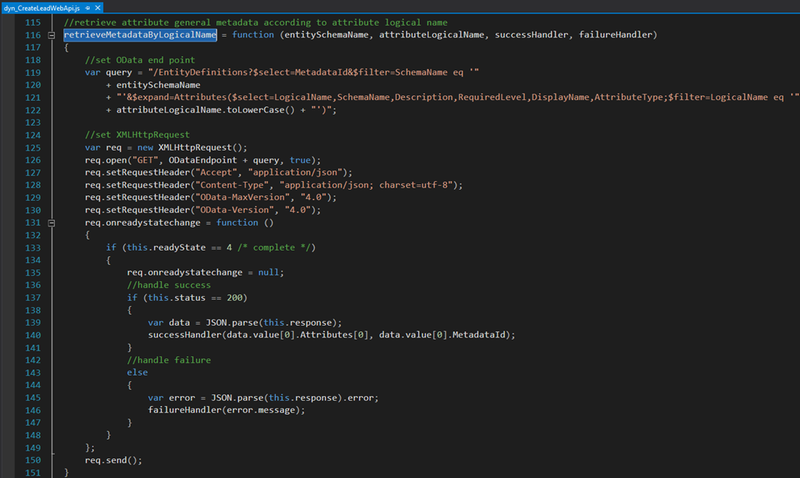 In this post, I’ll demonstrate a similar implementation, this time using Web API. You can download an unmanaged solution containing the working sample code presented in this post. Note that this is a different solution version from the one made available in the previous post. Retrieving type specific attributes (OptionSet options, number values range, text format etc.) 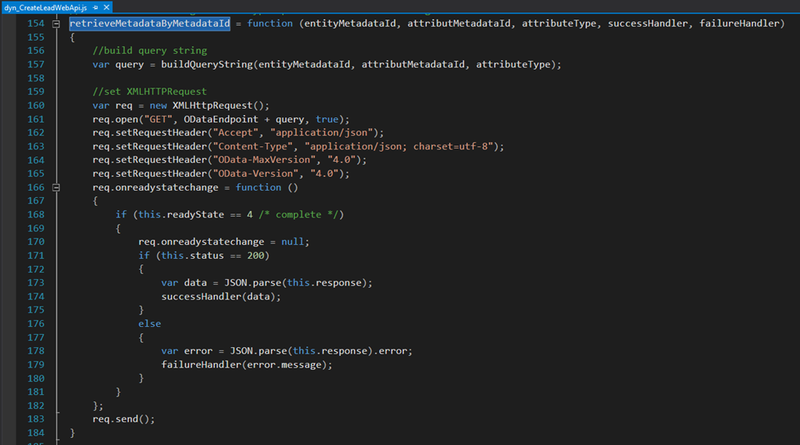 require a query involving the attribute MetadataId value, sometimes with a proper type cast. It means you have to know each attribute MetadataId in advance if you wish to perform only one query per attribute. Fortunately, entity and attribute MetadataId values are static between Organizations, so once you found the required MetadataId value, you can safely use it as a constant in your queries, even when importing code via Solution into other Organizations. As shown in the HTML below (contained in dyn_CreateLeadWebAPI.htm), I made some design changes to support both Logical name and metadataId. Adding just the logicalname attribute to any input control will cause the code to perform two queries to retrieve full metadata details. Adding the optional metadataid attribute will perform one query. Not adding any of the attributes will cause the code to ignore the control. The two interesting functions here are retrieveMetadataByLogicalName and retrieveMetadataByMetadataId which actually query metadata using Web API. 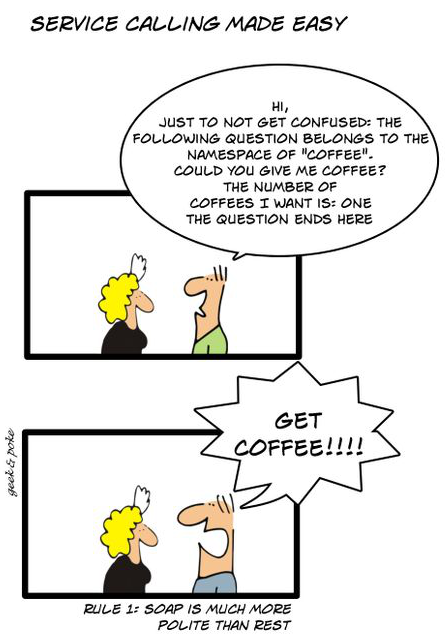 Note how simple it is to construct a query, submit it and parse the response. With minor effort, the sample code in the previous or current post can be turned into a JS library which will quietly apply the CAWR approach to your Web Resources just by referencing it. 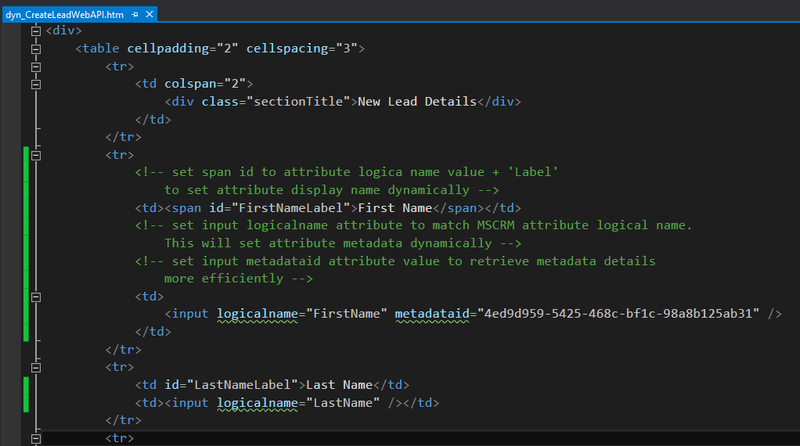 Setting HTML controls properties to match MSCRM attribute logical name or metadataid will enable the code to automatically retrieve and apply metadata. If you have any ideas or suggestions regarding the CAWR approach, share them here.